This is about a month old, I think. Can fly about a bit. Still has not mastered the art of grooming. 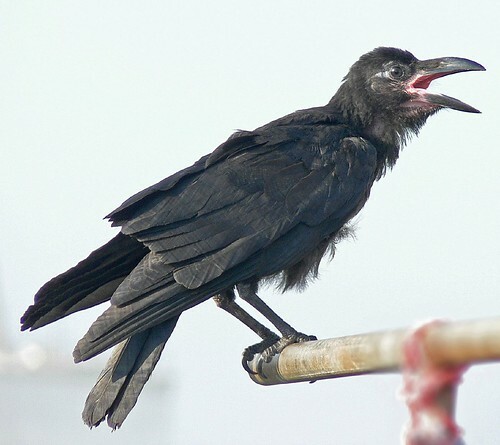 Do be careful with crows, especially when they have nests, eggs or chicks nearby. They can be pretty vicious in their attacks. Thankfully they leave my family alone. But some people are not so lucky. Someone known to us has to wear a helmet ot take an umbrella whenever he has to go to the terrace. He is a special target for the crows and they draw blood! They seem to target some specific people and usually peck them on their heads. I wonder why.